Patricia Jean Marie Koran Fohn, 75, transitioned to eternal life on April 8, 2019 surrounded by love. She was born on September 8, 1943 in Fort Leavenworth, Kansas as the second of five children to Robert and Pauline Koran. Not long after she was born, the family moved to Littleton, Colorado where many days were spent playing in the wheat fields and with animals on the farm. Pat spent weekends at Columbine Country Club pool perfecting her backstroke, for which she won first place at the Amateur Athletic Union. After finishing school at St. Mary’s Academy, Pat went on to work at Columbine Airport. This is where she met her husband of over 20 years, Lou Fohn. Together, they were blessed with four amazing children: Kelly, Holly, Tim and Stacy. Pat always said her children were her greatest life accomplishment. In addition to being a dedicated Mom, Pat’s early career included running an in-home infant daycare as well as clerking for a law office. While most of her adult life was spent in Colorado, Pat’s children convinced her to exchange the snowy winters for heat, humidity and most importantly more family time. In 2003, she made the move to Houston, Texas where her daughter Stacy lived. While in Houston, Pat spent a few years as an office manager for a local home builder, until she retired in 2014. 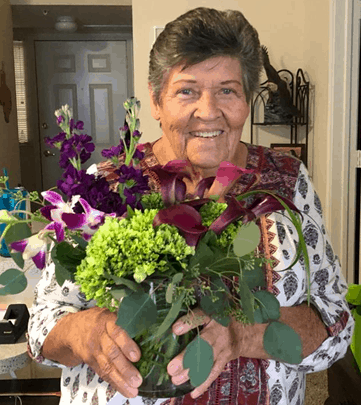 She continued to stay busy with several hobbies, which included painting ceramics, baking cookies, gardening and spending lots of time with her grand kids. After over a decade in Houston Pat moved north to Allen, Texas where her daughter Holly resides. Pat’s health and mobility gradually declined over the past year and she fell very ill at Christmas. In February, immediate family and close friends visited her and they all got to share fond memories together. Unfortunately, in late March Pat caught pneumonia and her body was too weak to fight it. Kelly’s most precious memory of her Mom was when she came to Italy in 1997 to meet Rachel, her first grandchild. Kelly felt it was truly amazing seeing the love in her Mom’s eyes as she looked at her granddaughter for the first time. Holly’s favorite memory of her Mom was when she cheered her on during her soccer games. She was her biggest fan and continued to be throughout her life. Holly also remembers all the times she kept Bailey, Allie and Aidan entertained by something as simple as running around outside or blowing bubbles. Tim’s favorite memory of his Mom was Christmas time. His words… “We always had a Rock Star Christmas!” Pat made everything magical – the best Christmas a kid could hope for. She always found the perfect gifts including his beloved BB gun and a “Chips” electronic motorcycle. One of Tim’s nicknames was “Ponch” (Poncherella). Stacy’s favorite memory was seeing the joy her Mom experienced looking after babies. She ran a wonderful daycare nurturing infants and supporting their parents. Stacy received that love and support when her two children entered the world and those kids’ cheeks were always raw from kisses. Pat is survived by her siblings, sister Cindy and husband Charles Ogren, brother Charles and wife Lucy Koran, sister Judy and husband John Taylor, proceeded by brother Robert (Bobby) Koran; her children, daughter Kelly and husband Luis Rivero, daughter Holly and husband Tony Battelle, son Tim Fohn and girlfriend Jennifer Guerrero, daughter Stacy and husband Michael Smith; and her beloved grandchildren: Rachel, Bailey, Allie, Aidan, Ethan and Elyse. Pat’s wishes were to spend eternity at some of her favorite places she visited throughout the years, so her ashes will be spread at a later date. If you wish to send your condolences, they can be shared on this Memorial Page. In lieu of flowers, donations can be made to Carmalite Monestary, 6138 S. Gallup Street, Littleton, Colorado 80120 (website or electronic giving not available). Ms Patricia you were loved , thank you for Being Holly’s mom you did well raising such a kind and loving daughter, you may be gone but you will never be forget.Fly with the angels Mama Holly .Peace ,love and Light. We wish to pay respect to Pat for being the devoted and loving mother that she was and the wonderful grandmother she became. Our condolences to all who are mourning her loss at this sad time. Aunt Patty was a beautiful, beautiful woman. I loved how she made you feel so special when you spent time with her. She was attentive and assured her family. Everyday was an amazing day with this truly selfless human being. Everyday was full of smiles and laughter. She was always happy to see me, danced in the hallways and made me smile when I walked into her room and she was sitting sideways with her legs dangling off like a teenager. I hope and pray she finds as much peace now as I know she had in life. She will live in my heart forever.